Halong Bay, Vietnam. Vịnh Hạ Long (Halong Bay) means Bay of the Descending Dragon. 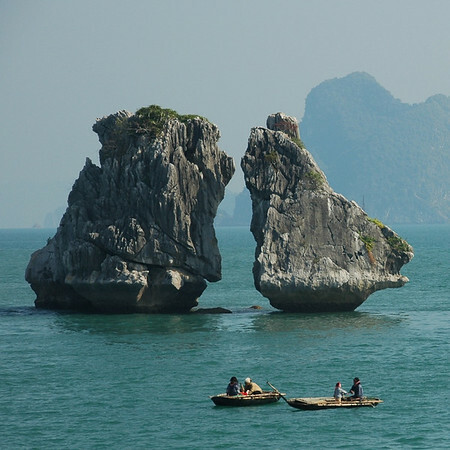 2000 limestone islands rise above the water a few hours away from Hanoi on the Gulf of Tonkin. 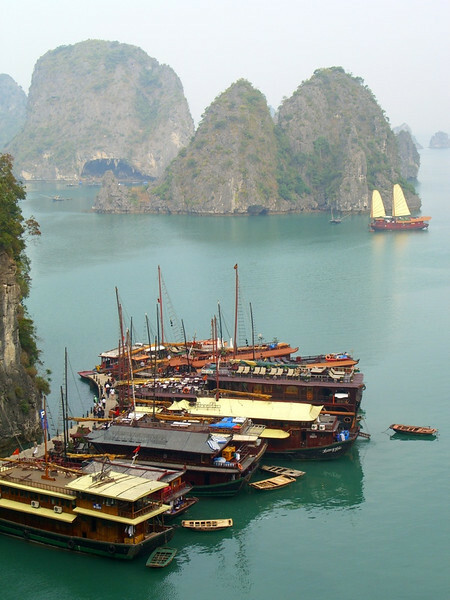 Read more about Halong Bay, Vietnam. The Vietnamese are very creative business people. Locals load up their rowboats with snacks and drinks and hawk their Oreos, Ritz, and Pringles to the tourists. 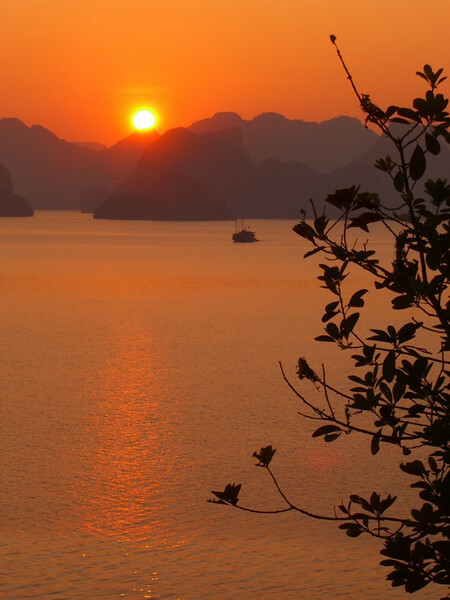 Read more about Halong Bay, Vietnam. New boats built with an old design, these Chinese junk boats battle the craggy island outcroppings in Halong Bay. 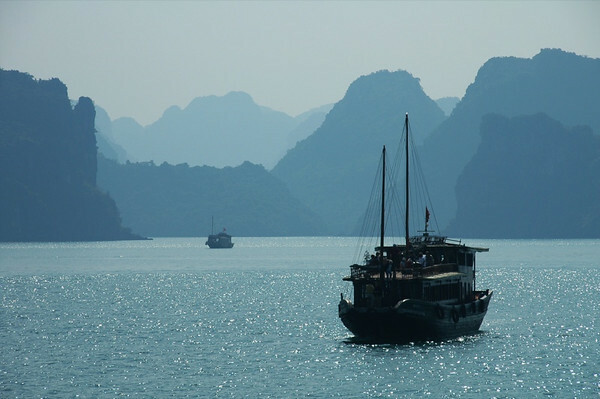 Read more about Halong Bay, Vietnam. Australians, Japanese, Irish and Americans (us) outline our boat's passenger manifest. Together, we enjoyed two days on deck, talking, eating fresh seafood, and enjoying the the peace and quiet of the bay. Read more about Halong Bay, Vietnam. 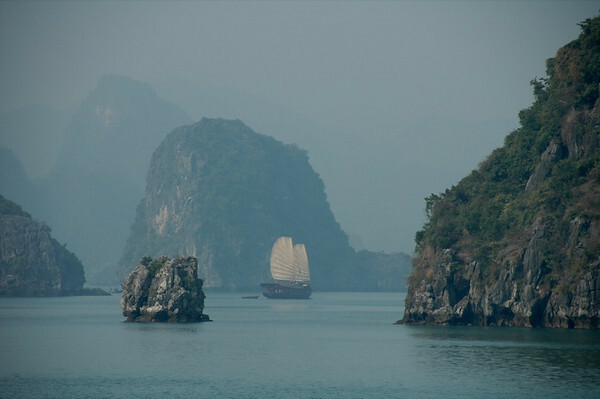 Boats navigate the misty limestone islands of Halong Bay. Read more about Halong Bay, Vietnam. 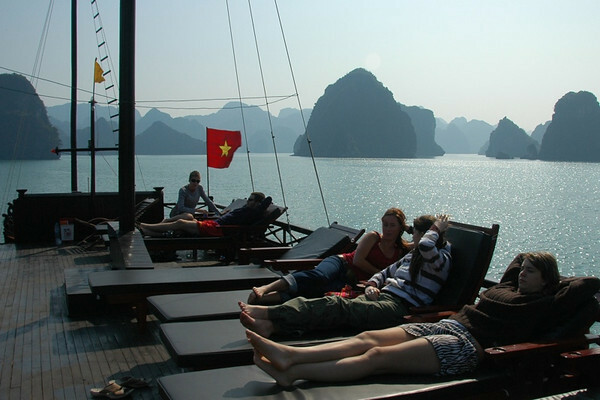 After spending two wintery weeks in Hanoi in January, we were thrilled to feel the sun's warmth in Halong Bay. We all flocked to the top deck to relax and soak it up. 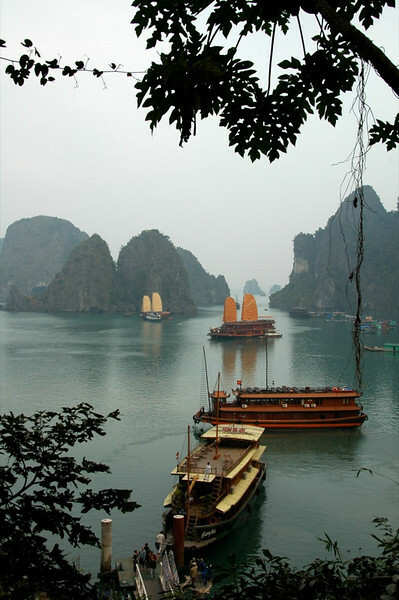 Read more about Halong Bay, Vietnam. 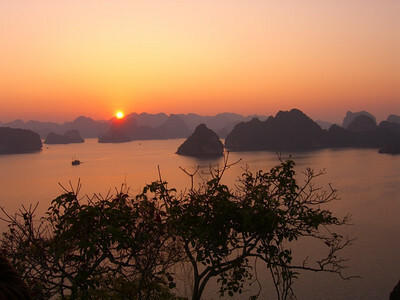 What makes Halong Bay distinctive are the dragon-like limestone islands poking out of the water. Read more about Halong Bay, Vietnam. 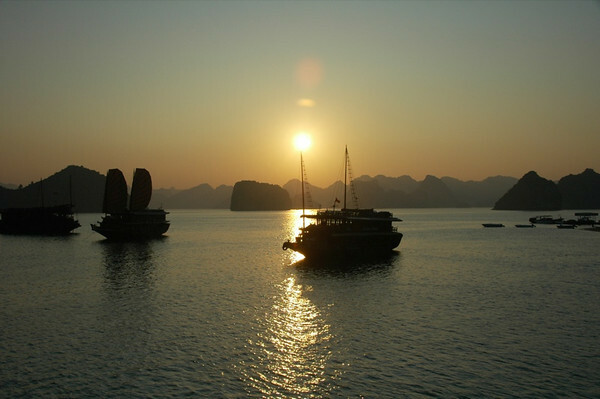 A Chinese-style junk boat at dusk in Halong Bay. 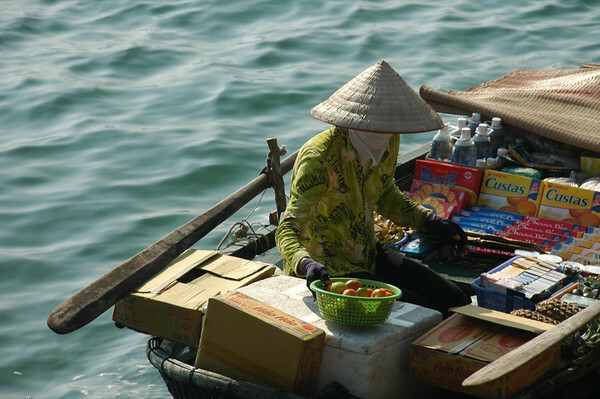 Read more about Halong Bay, Vietnam. 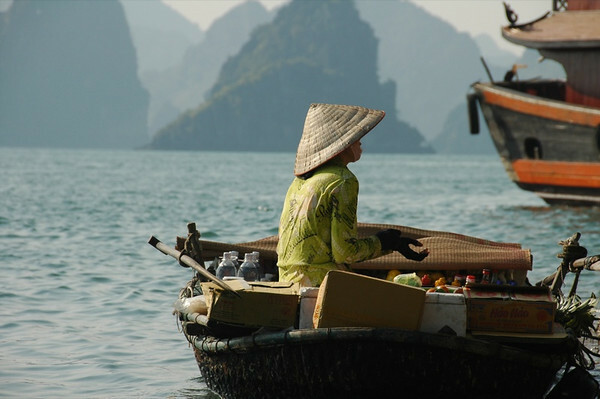 There are several floating villages in Halong Bay where fishermen live and work. 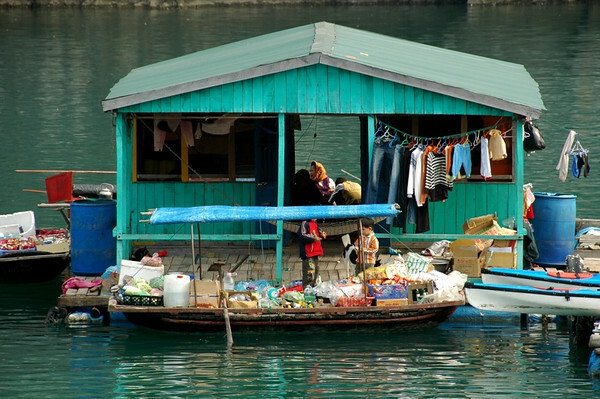 A food boat is docked at this floating house. Almost like having 7-11 come to your door. Read more about Halong Bay, Vietnam. Boats and Crags - Halong Bay, Vietnam Read more about Halong Bay, Vietnam. Boats line up at the dock, waiting for tourists to return from the cave. Tourist boats come in different sizes and styles, from the more private boats (up to 16 people) to the group floats (30 to 40 people). 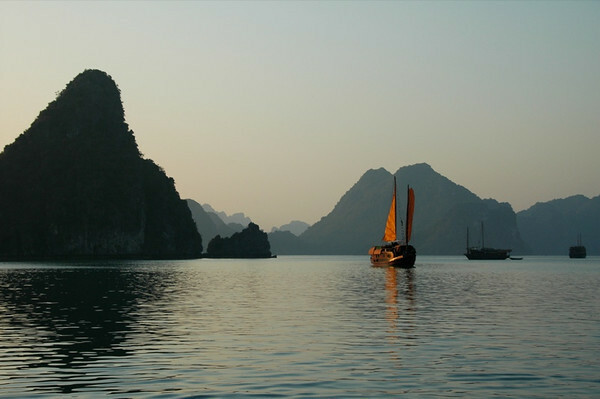 Read more about Halong Bay, Vietnam. We were amazed at the availability of Oreos in southeast Asia - Nabisco must have an amazing distribution system. Oreo penetration runs from the largest of cities to the tiniest of villages. Read more about Halong Bay, Vietnam. Read more about Halong Bay, Vietnam. We spent one night aboard our boat. All the boats anchored close enough to each other for safety, but far away enough that we didn't hear one another. After all the motorbike and Cathedral bells in Hanoi, we were not accustomed to the sound of silence. Read more about Halong Bay, Vietnam. 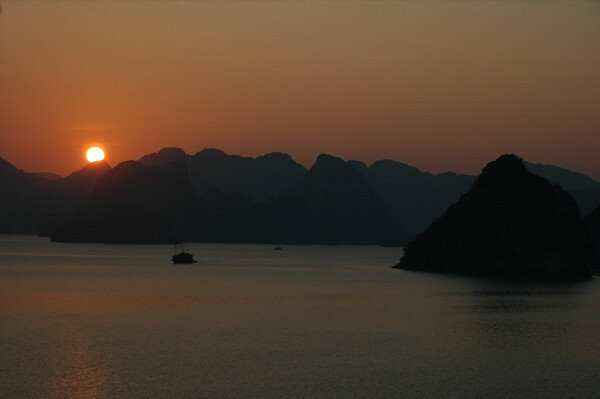 Another magical moment in Halong Bay... Read more about Halong Bay, Vietnam. Beautiful Sunset - Halong Bay, Vietnam Read more about Halong Bay, Vietnam. Sunset Colors - Halong Bay Read more about Halong Bay, Vietnam. 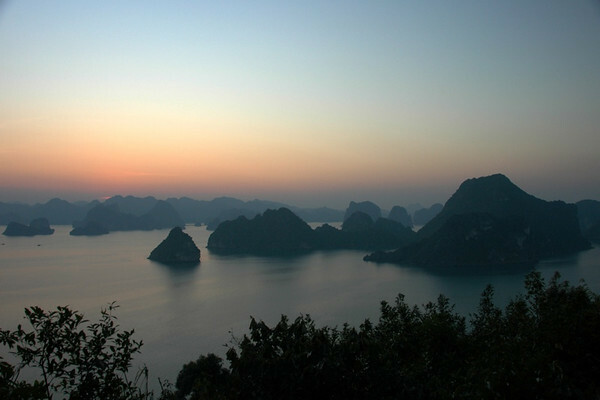 After sundown in Halong Bay. 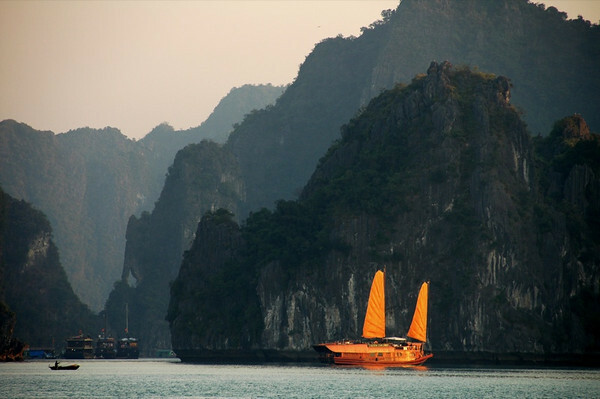 Read more about Halong Bay, Vietnam. Sunset - Halong Bay, Vietnam Read more about Halong Bay, Vietnam.